I started reading Green Arrow Vol. 3: Harrow with surprising optimism. I hadn't initially enjoyed Ann Nocenti's Green Arrow Vol. 2: Triple Threat, finding it too flip and scattered; in the interim, however, I read Nocenti's Catwoman Vol. 3: Death of the Family, and came to understand that scattered, at least, seems to be the charm of Nocenti's writing style. Armed with better expectations, I read Triple Threat again and enjoyed it more (if not "entirely"), especially Nocenti's "royal screw-up with a kind heart" Green Arrow. My hope was those good feelings would carry over to the third volume. Unfortunately, in this oddly-shaped third volume Nocenti only really gets two issues to herself (plus the Hawkman: Wanted crossover issue), and if I was on the fence about Nocenti's scattershot aesthetic in Greeen Arrow, Harrow pushes me to the unfavorable side. One too many absurd or nonsensical moments spoiled the book for me. Also Nocenti loses artist Harvey Tolibao in this volume, replaced with Freddie Williams; whereas Tolibao's art had a smoothness that made some of Triple Threats bizarre moments more realistic, Williams offers all-out wacky cartoonyness that makes the silly parts seem even sillier. This book is a far cry from Mike Grell's Green Arrow and the Arrow TV show, as evidenced by a certain cameo at the end of this book and the switch to a new creative team with the next volume. Astoundingly enough, probably the best chapter of Harrow is the first, Nocenti's tie in to Rob Liefeld's Hawkman: Wanted crossover. Freddie Williams's artwork is wildly all over the place, but Nocenti brings some surprising depth to her Oliver Queen as he and Hawkman compare notes on the lonely life of a warrior. Though Nocenti's Chinese superhero Susie Ming still comes off as a cliche to me, she shares a nice moment of conversation with Green Arrow and we can see how Nocenti has Oliver on a journey from being a basic jerk to aspiring to better heroism like Ming. Character-wise, it's a good start to the book. The issue of Savage Hawkman by Rob Liefeld and Joe Bennett, collected next, is also a "good enough" team-up, though it's somewhat strange to see Green Arrow and Hawkman as "friends." Hawkman readers will recognize that the issue cuts off before the actual end, however (and even before some additional Green Arrow material), and it's the first indication of what an unusually-structured trade this is. It collects Green Arrow #14-16, one of which is the Hawkman crossover, so essentially just two "regular" issues from the "regular" creative team, less than half the book. Almost the same amount of pages go to reprinting Justice League #8 from Villain's Journey and the back-up story from #13 from Throne of Atlantis. The one-off Zero Month issue that finishes the trade is written by Judd Winick. The effect is not so much "the next volume of Green Arrow" but rather a somewhat hodgepodge collection of "what Green Arrow has been up to lately in the corners of the DC Universe." That's an interesting trade concept, to be sure, but it doesn't work here largely because Green Arrow isn't consistent across the material, especially between Nocenti and Geoff Johns's issues, where Oliver is quite suddenly talking about social issues he never seemed to care about before (Johns similarly made Hawkman "his own" in the new Justice League of America series). As a result, Harrow feels like a trade in want of material -- as if DC didn't really have enough material to fill a final Nocenti volume but didn't want to include any of new series writer Jeff Lemire's material, so they stuck in two already-reprinted Justice League stories. I don't have an alternative necessarily, but it remains that a little less than half of this trade is reprints. There are elements of a viable storyline in the two-part titular "Harrow," like Oliver's recurrent head injury that might have stood as a metaphor for the current discussions of head injuries and professional sports. But Nocenti's story includes a number of over-the-top elements, again made even more over-the-top by Williams's artwork, that fell flat for me: that gamblers pay to watch dogs fight children, that a seemingly normal child in this situation manages to beat a raging pitbull, that this same child, Pike, knows how to wire an entirely building to explode and then does so in about a half-hour span and so on. Green Arrow is basically lead from plot point to plot point through the story by Pike and Gloria (whom Williams depicts basically as a dead ringer for Jessica Rabbit); there's not a lot in the story's conclusion to differentiate it as a "Green Arrow story" versus putting another character in the same position. Most damaging is that the story never addresses why the villain is called "Harrow" other than that he's Oliver's "opposite number" thematically; that Green Arrow fights Harrow un-ironically rather makes it seem like Nocenti is making a joke that isn't funny (what's next, Batman versus Hatman? Superman versus Duperman?). It's notable therefore that the closing Zero Month issue is the first to use a character from the Arrow TV series in the comics. 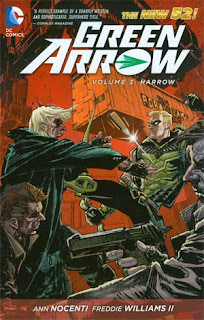 Even as Lemire's more Arrow-esque run doesn't begin until the next volume, one senses DC realizing the Green Arrow title's tone needed to change at the point in which they proceeded to introduce Tommy Merlyn as a villain in the comics. Writer Winick penned some dynamite Green Arrow comics in the Infinite Crisis era; unfortunately this issue is formulaic as origin stories go, the kind of thing you might expect to find in a Secret Files issue and miles from the Green Arrow: Year One miniseries. Still, it's obvious here a change is going to come. Green Arrow Vol. 3: Harrow turned out about how I originally expected, and perhaps the less said, the better (this review notwithstanding). For fans reading Green Arrow and Justice League of America without reading Justice League (as unlikely as that might be), then perhaps Harrow has some material for you; otherwise most will just want to jump on fresh with Jeff Lemire's Green Arrow: The Kill Machine to come. Speaking of which, we continue with Jeff Lemire's Green Arrow Vol. 4: The Kill Machine, next time. Ann Nocenti's another one of those writers who's had success in the past (I've haven't read her work on Daredevil in the '90's, but many people speak highly of it; Doug, maybe you've read it? ), but has yet to, in my opinion, to write anything good at DC. Unlike someone like Tom DeFalco or Paul Levitz, her work isn't a mediocre exercise in spinning its wheels, which is good, I guess? She has some downright bizarre ideas, which are certainly more than inventive than the majority of her peers at DC, but her execution is so lacking that they end up being kind of off-putting. Like, I enjoy weird comics, but sometimes I wonder what she's thinking. J. Caleb Mozzocco pointed out one line that I had forgotten about in Catwoman, "[Joker's] so blind he can't see he just wants to be Batman's be-yotch." As far as GA is concerned, I kind of remember DC soliciting that Jeff Lemire would be taking over the series an unusually long amount of time beforehand (at least 6 months, if memory serves). At the time, it came across to me as something like "We know this series is awful, but Jeff Lemire will be here soon. Please stick around until then." I've been trade-waiting for Lemire's take, but my understanding is that he more or less rebooted the title. 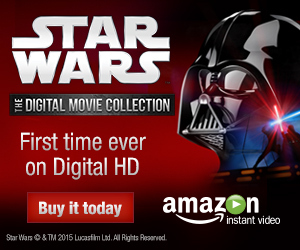 Given what came before him, that was probably a wise move. I've read bits and pieces of the run, notably those crossover issues and one of the Typhoid Mary stories. They've been putting out trades of the run recently and I'll try to put one on the review schedule. Scott -- Kind of besides your point, but having just finished reading Lemire's first book, I can say that while he does send the book in a new direction (that requires little knowledge of what came before), I don't consider it a "reboot" per se. Lemire actually (and admirably) keeps continuity with the first three books, even as indeed he sends the story in a new direction.